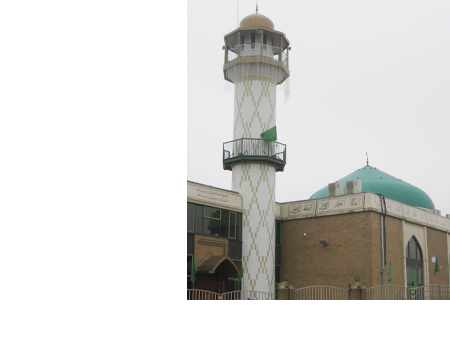 A smaller project, completed in October 2009 which involved the re–tiling of the concrete parapet panels to the perimeter of this established mosque. The original building was built over 25 years ago. This project involved having porcelain tiles printed with Islamic calligraphy by a specialist printer. In addition the existing minaret was cut back to the original brickwork, this was then re–tiled with glass mosaics to create a geometric pattern. The existing minaret was enhanced by new light mounted on a new intermediate balcony.